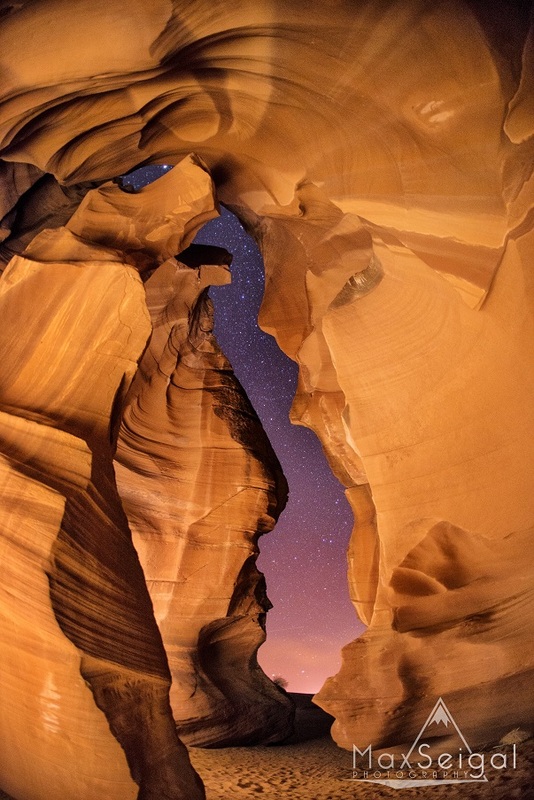 Wow….this is one of the coolest things to do if you’re interested in night time photography. It will test all your skills and push you to the limits. It demands perfection in lighting, technique, composition, content and everything else you can imagine, but it is INCREDIBLY fun and rewarding! Shooting in slot canyons during the day can be one of the most frustrating things in the world, namely because they can be JAM PACKED with people (think Antelope Canyon here...) And I literally mean shoulder to shoulder. You feel like a crammed sardine, it’s no fun! But what I love about shooting at night is that you’re the only one there!!! It’s peaceful (as it should be), and you can enjoy the atmosphere and the solitude. But there’s one problem with shooting at night… there’s no light! Does this make you want to go to the canyon in the day??? During a typical night shoot, I can crank up my cameras ISO and drop the F-stop enough to capture the ambient light off the stars, moon, or whatever else is out there. But the second you walk into a slot canyon, it’s a whole new game. There’s absolutely no light coming in – it’s pitch black. You may have a tiny slot in the roof where stars can be seen, but there’s no way you’re going to pick up any light from them on the camera sensor. So what do you do? Flashlights!!! Lighting the slot canyon with flashlights is AWESOME, you can do some super creative and unique things. I felt like a kid at Christmas when I was playing around with my lights in there because each and every shot is different from the last depending on how you light the walls, so you start to get your technique down and it’s as if each picture gets better and better and better until you start getting some amazing results! So what are the challenges? First of all, getting the RIGHT amount of light is very difficult. It’s easy to shine too much or too little, resulting in hot spots or black spots, but getting the light to where its evenly lit is very tough. In these two images, you can see that I was definitely shining way too much light and the photos were coming out totally overexposed. This is ok for the first few shots, you gotta figure out how much light you need! You cant expect to get a perfect image on your first go! Watch out! Dont ruin the photo be being in it yourself! Second challenge: evenly lighting everything. Sure, you can get the proper lighting on the walls to your left and to your right, but how do you evenly light the wall 30 feet above you to the same extent? How do you light up those shadows where there are curves in the canyon? Here’s the clue: lots of practice with bouncing the light. I never, NEVER, shine the light directly on the wall. Everything I do is ‘bounce’ light. And on top of that, my feet are always moving when the exposure is going. I literally RUN around that canyon floor while my camera is shooting (typically around 30 seconds to one minute), shining the light on the floor of the canyon so that it bounces up to the walls. BUT!!! one thing to be careful of! When you're running around lighting up the walls, make sure you dont light yourself in the photo! It's easy to do, and it will result in a little person running around in the picture, so be concious of where you are in regards to the light! Third challenge: Getting an interesting subject. Once you have your technique down and you can light everything well, that doesn’t mean you’re going to get a cool photo. You need an engaging subject! And when it’s pitch black in there and you cant even see through your viewfinder, that can be a real challenge! So what do you do? Just keep shooting!!! Move the camera, move your feet, change the angles, move spots, always try looking for something different. Don’t settle for one spot or one angle that you think is the one – keep looking for something new and engaging! Very similar to the next image, but this one was shot about five feet to the left. Just because it's composed well and evenly lit doesnt make it a great photo though! Very similar image to the one on the left, but I moved a few feet to the right and angled the camera slightly different. Notice how just these slight differences can result in dramatically better photos. Now…if you want to get really creative, you can add another element of light into your photographs. Orbs!!! Light orbs, fire orbs, whatever orbs you can come up with! These are awesome to play with, and can result in some really, really neat photos. So get creative! And most of all, HAVE FUN! And so are light orbs!